Shot on Negros Island, photographed at the Bulata village in the municipality of Cauayan, Negros Island on May 31, 2010. He was attempting to get the leaves from this branch. This specific subspecies can only be found in the Philippines (endemic). This location is about 10 minutes away by boat from Danjugan Island Marine and Wildlife Reserve, a known sanctuary for birds. This is sometimes called the Scaly-breasted Munia or The Spice Finch. It is also one of the birds mistakenly called "maya" in the Philippines. 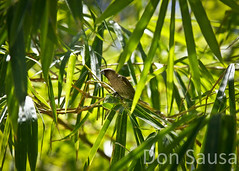 They will call almost any small brown bird as "maya" down here.